This is a fine example of the Adam and Charles Black's 1844 map of Persia and Afghanistan. Centered on Yazd (Yezd) in modern day Iran, the map covers Iran, Afghanistan and parts of Pakistan, Iraq, India and Turkmenistan. 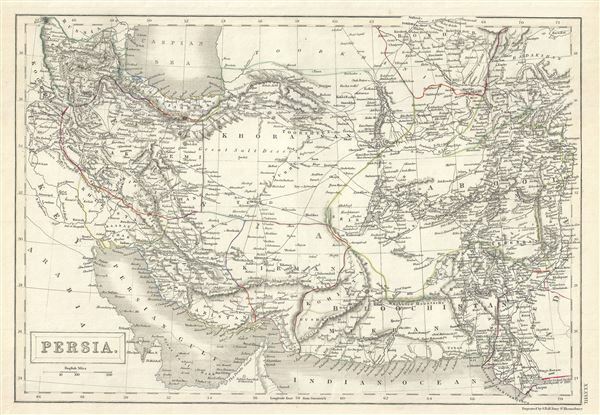 It is curious to note that the northern borders of Persia, east of the Caspian Sea, are indistinct and suggestive of a general lack of knowledge regarding central Asia in the middle 19th century. Various towns, cities, rivers, mountains and several other topographical details are noted with relief shown by hachure. In the Kutch district of Modern day Gujarat, India, the map notes a Lake formed by the earthquake of 1819, referring to the Sindri Lake. Persia at this time was controlled by the powerful Qajar Dynasty of Shahs. This map was engraved by Sidney Hall and issued as plate no. XXXVIII in the 1844 edition of Black's General Atlas. Rumsey 2305.043 (1854 edition). Philips (atlases) 4334. Alai, C., General Maps of Persia 1477-1925, E278.